After we retired the Atari, my brother bequeathed me his Commodore 64 and his collection of 5.25″ floppies. Few of the disks had proper labels. Here and there you could make out a word crummily penciled onto an aging sticker. I dimly understood that most of the set had been copied from copies of software owned by my brother’s friends, but mostly, I just knew that they were mine now. A jumble of code would cascade onto the blue screen, the processor would begin to whir, and after a few minutes, more often than not, it would groan and cough and settle to a halt. This meant the disk had been corrupted. But every now and then, I’d slip in a disk and something marvelous would occur: inside the computer I could hear a stirring accelerating into flight, the cursor on the screen would disappear, the field of blue would change to black or white, and a program would begin. Out of dozens and dozens of disks, only a few games are still vivid in my mind. Oddly enough, though, none of the most memorable games had pictures. No, my favorite games were the text adventures – interactive books that teased you, questioned you, responded to you, and in the process, told you a story. My favorite of the text adventures was called Wishbringer. In it, you played a postal worker sent to deliver a mysterious package, finding yourself all of a sudden in a cruel twilit world mirroring your own. A menacing band of “boots” (no bodies, just footwear) tromps around the town seeking anyone out past curfew. To win the game, you must avoid the boots and complete your errand before midnight. But I never got that far. Just because a game loaded didn’t mean the disk was not corrupt. Inevitably, when I reached a crucial juncture in Wishbringer, the computer would heave, report a fatal error, and abort. The story remained unfinished. But even knowing the disappointment ahead, I played that game again and again, just to let my imagination simmer in that world a little longer. This is all a roundabout way of telling you about a wonderful thing on the Internet. Wishbringer was one of many titles created by a legendary company called Infocom, the folks that brought us Zork (“You are likely to be eaten by a grue”), A Mind Forever Voyaging (you play a computer simulation who’s spent his life thinking he was human), and Bureaucracy (“Your blood pressure just went up”). All of these titles are available, in their entirety and in every known version, here. No whirring or heaving required. This, my friends, is what the Internet was invented for. Thanks, MetaFilter! 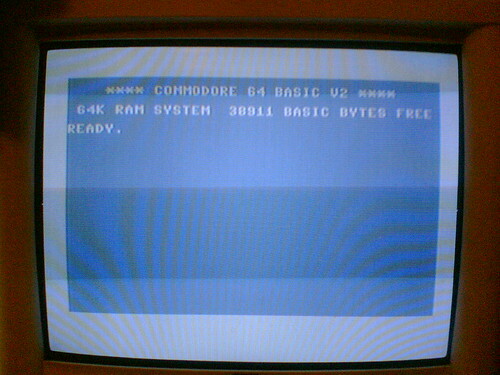 Commodore 64 image courtesy of mpolla on Flickr. I remember you raving about Wishbringer but I did not realize that your copy crashed randomly. That is so weird/cool. Like having a book with pages missing, and you read it over and over, filling in the gaps with your imagination… wow. I guess in some ways I had a similar experience—my first text adventure, on the old Mac Plus, was the Infocom adaption of Hitchhiker’s Guide to the Galaxy. A book that I had never read. I played for weeks, always getting killed by the most random things, or being completely at a loss for what I was supposed to do next. At one point in particular, I hit a complete brick wall. So in desperation I turned to the book. Reading/skimming, churning through the pages, treating it almost as a video game strategy guide. Turns out you have to put the fish in your ear. P.S. I love your choice of words around the disk drive: “a stirring accelerating into flight.” You evoke the real physicality of old computers, old disk drives—it’s mostly just silence these days, but man, yeah, those things use to crunch and whirr… and fly! We’re the first adults with a childhood romance with 1’s and 0’s. Your listful recollection is well stated!